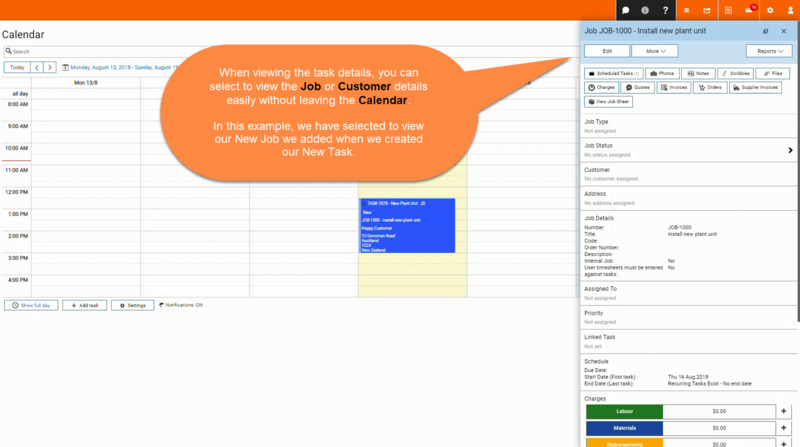 Calendar Add task - Desktop – Welcome to the NextMinute support and feedback centre. Creating Jobs and Tasks are core functionality of your job management. You and your team will spend much of your time adding and reviewing your work activity in the Jobs, Scheduled Tasks and Calendar areas of NextMinute. 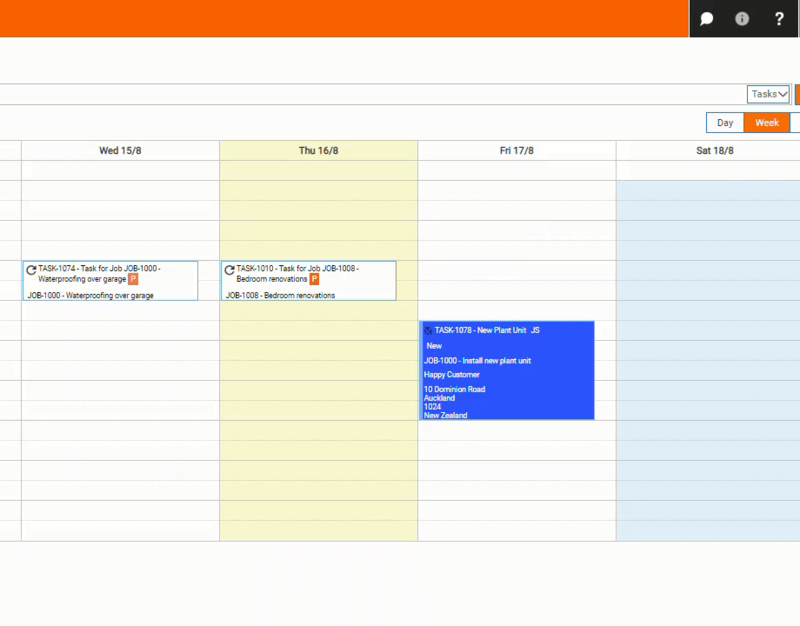 In this article we show you how to create a Task via the Calendar area. There are three ways you can create a new task to add to your calendar. As highlighted in the screenshot below. 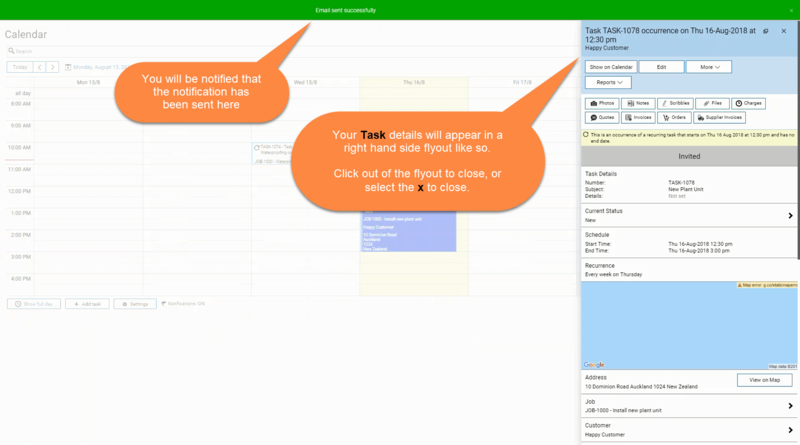 Click and drag down on an area of the calendar you are wanting to schedule a task for and start typing to bring up the New Task form. 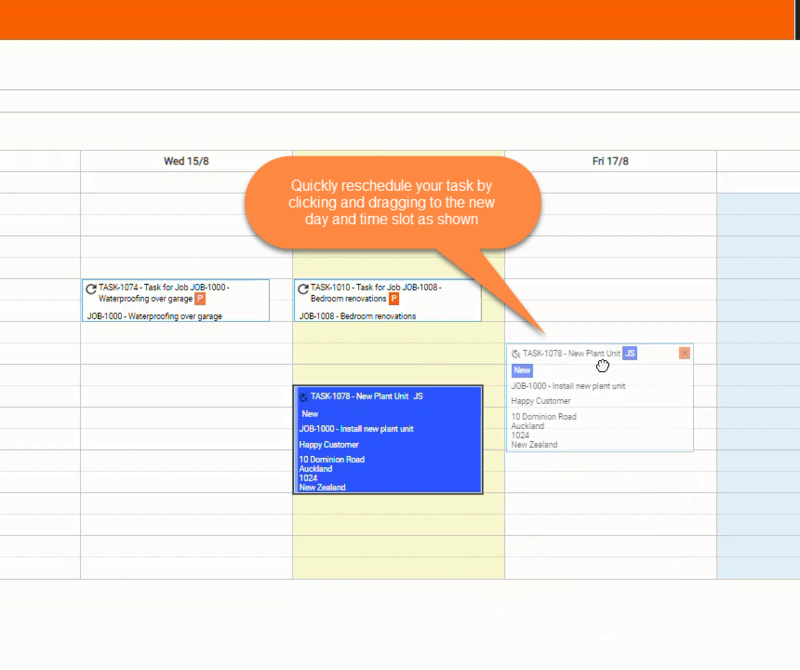 Click on an area of the calendar and select Create New Task. Fill in the Add Task form as shown below. You will need to add a Title before saving. You can assign your new task to an exisiting Job or create a new Job straight from the Add task form and fill in the Job details later. You can customise task Statuses, Importance, Priorities and Categories via your setup checklist and scroll down to Lookup Lists. If you selected to Send notification, the below message box will pop up after saving. You can select to send as an Email or SMS, add multiple recipients, edit the message or add a message template you have created, preview and hit Send when happy. You will be notified at the top of your screen that the message has been successfully sent and your new task has been created and will appear on the right hand side of your screen, as shown below. Click off to the side or select the x to close the task flyout. Your new task is sitting in your calendar. 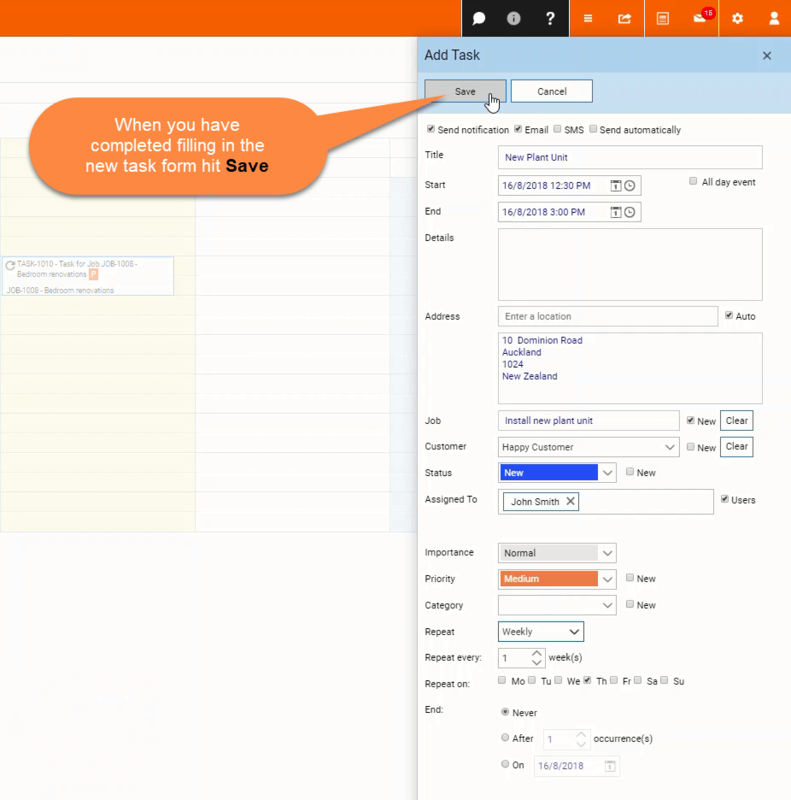 To view or edit the tasks details and view any other information relating to the task simply click on it to open the right hand side flyout. You are able to quickly click into the relating Job to view its details, view the customer details, and any other attachments without leaving your Calnedar. 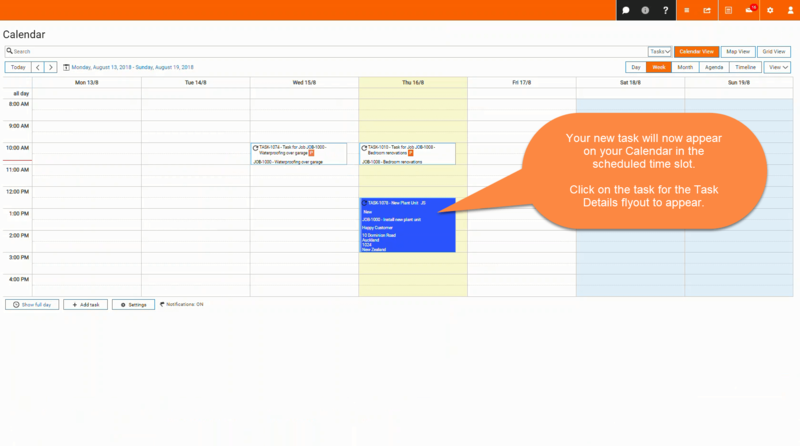 Quickly reschedule Tasks by selecting the task and dragging to the new time or day, as shown below.